LSU Sophomore Running back Chris Curry (24) during the spring game on Saturday, Apr 6, 2019. LSU sophomore wide receiver Ja'Marr Chase (1) runs downfield during the Tigers' spring football game in Tiger Stadium on Saturday, April 6, 2019. 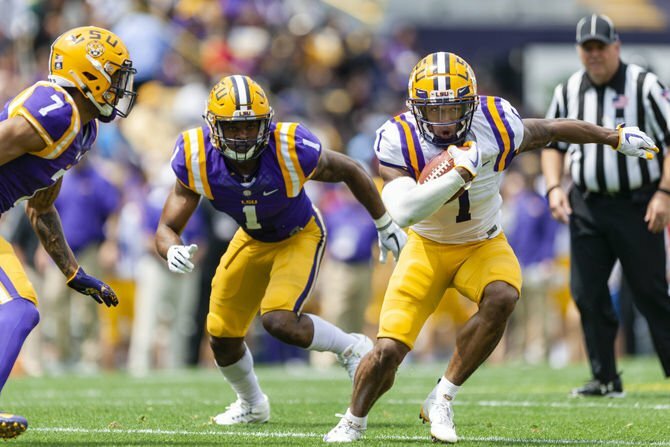 The LSU Football team plays during the spring game on Saturday, Apr 6, 2019. LSU senior punter Josh Growden (38) during the spring game on Saturday, Apr 6, 2019. 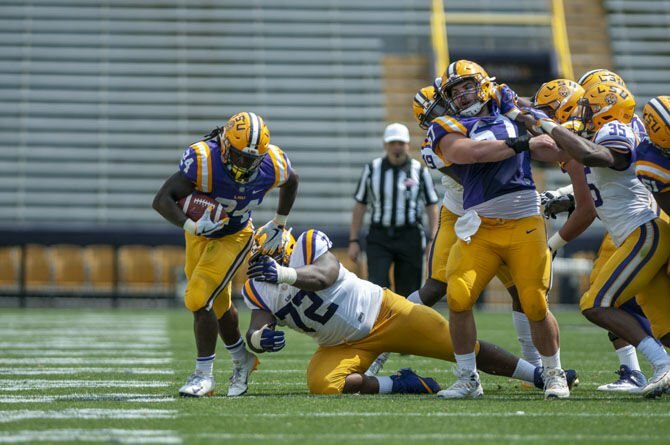 LSU football players watch as junior cornerback Lloyd Cole (34) and freshman wide receiver Racey McMath (17) chase down a ball during the Tigers spring football game in Tiger Stadium on Saturday, April 6, 2019. LSU Sophomore quarterback Myles Brennan (15) during the spring game on Saturday, Apr 6, 2019. LSU football players exchange words after a play during the Tigers spring football game in Tiger Stadium on Saturday, April 6, 2019. LSU football players celebrate after a score during the Tigers' spring football game in Tiger Stadium on Saturday, April 6, 2019. LSU Freshman Cornerback Derek Stingley Jr. (24) celebrates with Senior Wide Receiver Jonathan Giles (12) during the spring game on Saturday, Apr 6, 2019. LSU sophomore kicker Avery Atkins (32) kicks a field goal during the Tigers' spring football game in Tiger Stadium on Saturday, April 6, 2019. LSU Senior Punter Josh Growden (38) holds the ball while sophomore placekicker Avery Atkins (32) punts the ball during the spring game on Saturday, Apr 6, 2019. LSU senior tight end Stephen Sullivan (10) makes a catch during the Tigers spring football game in Tiger Stadium on Saturday, April 6, 2019. LSU sophomore safety Grant Delpit (7) signs autographs after the Tigers' spring football game in Tiger Stadium on Saturday, April 6, 2019. LSU senior quarterback Joe Burrow (9) takes the snap during the Tigers spring football game in Tiger Stadium on Saturday, April 6, 2019. LSU Senior Punter Josh Growden (38) holds the ball while Junior placekicker Connor Culp (34) punts the ball during the spring game on Saturday, Apr 6, 2019. LSU football coach Ed Orgeron enters Tiger Stadium before the Tigers' spring football game on Saturday, April 6, 2019. LSU football coach Ed Orgeron interacts with fans after the Tigers' spring football game in Tiger Stadium on Saturday, April 6, 2019. LSU senior defensive linemen Breiden Fehoko (91) signs autographs after the Tigers' spring football game in Tiger Stadium on Saturday, April 6, 2019. LSU sophomore linebacker Damone Clark (35) chases down LSU senior running back Lanard Fournette (27) during the Tigers spring football game in Tiger Stadium on Saturday, April 6, 2019. LSU senior quarterback Joe Burrow (9) throws the ball during the Tigers' spring football game in Tiger Stadium on Saturday, April 6, 2019.